The Liberal Party says it has contacted "appropriate authorities" in its review of an alleged assault against a First Nations woman by a man during a climate change rally featuring Prime Minister Justin Trudeau on March 4 in Toronto. The Liberal Party says it has contacted "appropriate authorities" in its review of an alleged assault against a First Nations woman during a climate change rally attended by Prime Minister Justin Trudeau on March 4 in Toronto. Trudeau's speech at the rally at Danforth Music Hall was interrupted several times by heckling and protests. 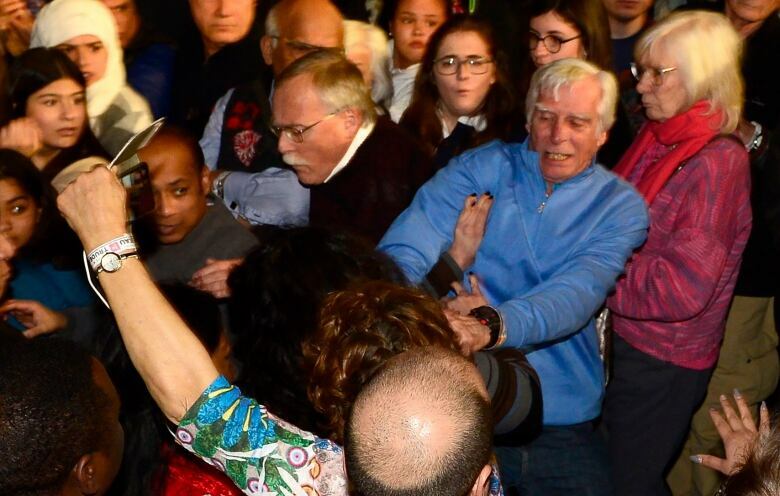 However, video and photographs captured one particular incident involving an older man in the audience who appears to push Vanessa Gray, 26, to the ground. Video of the alleged assault has circulated widely on social media. "The incident...has been brought to our attention and the party is taking steps to review the matter with the appropriate authorities and our own staff," said the emailed statement from Liberal Party spokesperson Parker Lund. "Allegations of this nature are taken very seriously, and we encourage any individuals with such concerns also contact the party and police directly." Lund did not respond to a followup question asking if the reference to "appropriate authorities" meant the party had contacted police. 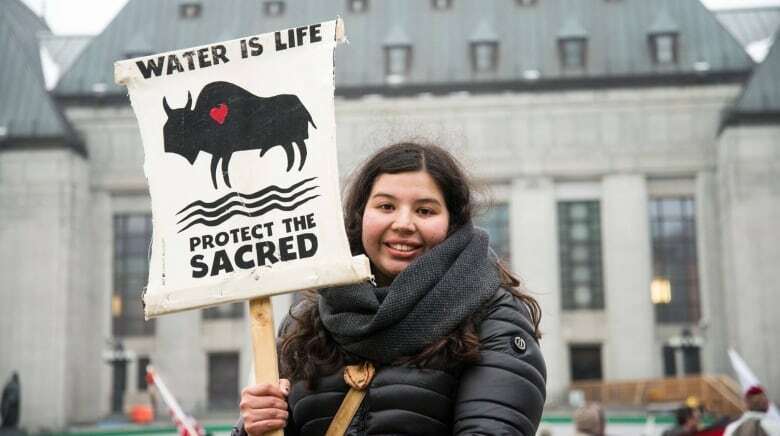 Gray, from Aamjiwnaang First Nation in Sarnia, Ont., said she was pushed to the ground after she started to chant "No justice on stolen native land" during the rally. She said she also pulled out a Canadian flag with the same words scrawled across it as she began her chant. "I started chanting, and then the guy in front of me turned around and yelled something, and he threw me into a lot of people in the crowd. I lost my footing and fell," she said. "He grabbed my right arm and then tossed me.... He was attacking me; it was really fast." Gray said that while she was ready to get ejected from the rally, she wasn't prepared to face a physical reaction from someone in the crowd. "I was just surprised and I really didn't have a moment to react to it in time," she said. "I was a little sore the next day." Josh Gibson, 44, said he saw Gray fly past him as she tumbled to the ground and he immediately turned to see the man as he was finishing his push. "That guy was very angry," said Gibson, a former bartender, who intervened moments after the incident. "There is a difference between a push and what he did to Ms. Gray. It was violent. It was bad." Gibson said he alerted a nearby member of Trudeau's RCMP detail to point out the man for ejection. "I said, 'That guy assaulted her," he said. "And he said, 'The locals will take care of it.'" 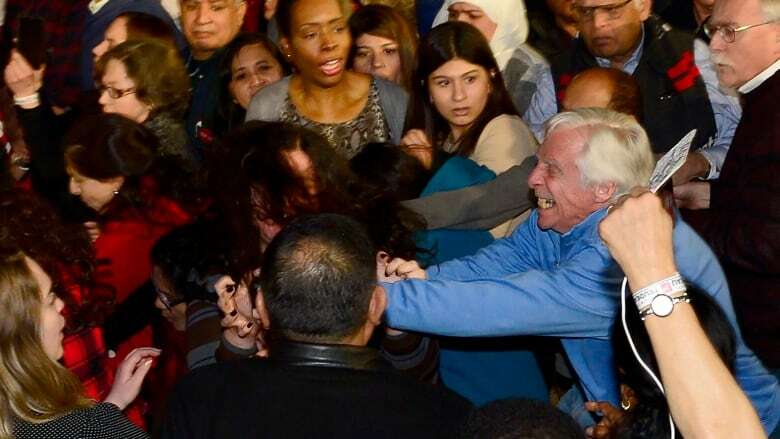 The man, who has yet to be identified, remained at the rally. Gibson said he crossed paths again with the man later during a long lineup for coat check and confronted him about the incident. "I said something like, 'You should be in jail,'" said Gibson. He said the man responded by saying Gibson didn't know what happened. Gray is now represented by Nick Cake, a London, Ont., lawyer with Millars Law. Cake said work on the matter is in its preliminary stages, but a police complaint coupled with civil action are options currently on the table to hold all responsible parties accountable. "Vanessa was well within her rights to do what she did and to say what she said ... without fear of reprisals from militant members of the public who may disagree with her," he said. Cake said the video of the alleged assault was "shocking" and counter to the freedom of expression ingrained in Canadian society. "It looks like we are at a Trump rally in the States," he said. Trudeau appeared to witness the incident and said, "Oh boy, oh boy," moments after Gray was pushed to the ground, according to video of the event. The Prime Minister's Office referred questions to the Liberal Party, which it said organized the rally. Toronto police said in an emailed statement that it has no police report on the matter. The RCMP, which provides protection for the prime minister, said in an email that matters of public safety are the responsibility of the local police. Gray said she decided at the last moment to attend the Trudeau rally, and felt compelled to voice her concerns over local issues affecting her First Nation from the industrial area known as the "chemical valley" in Sarnia and national issues around climate change and Indigenous rights. On Feb. 19, weeks before the rally, Gray and a lawyer from the environmental law group Ecojustice were informed Ontario would not charge Imperial Oil over massive flaring at its Sarnia refinery in February 2017. Gray and Ecojustice filed a complaint over the flaring. "The fact it was a climate rally felt like a really good opportunity for me," she said. "What else do we do about these multibillion-dollar corporations constantly spilling? Even when we do take legal action, the government isn't willing to do the work." Gray said there was a large police presence at the rally, but none asked her about the incident. Instead, she said, she was forced to leave the event. 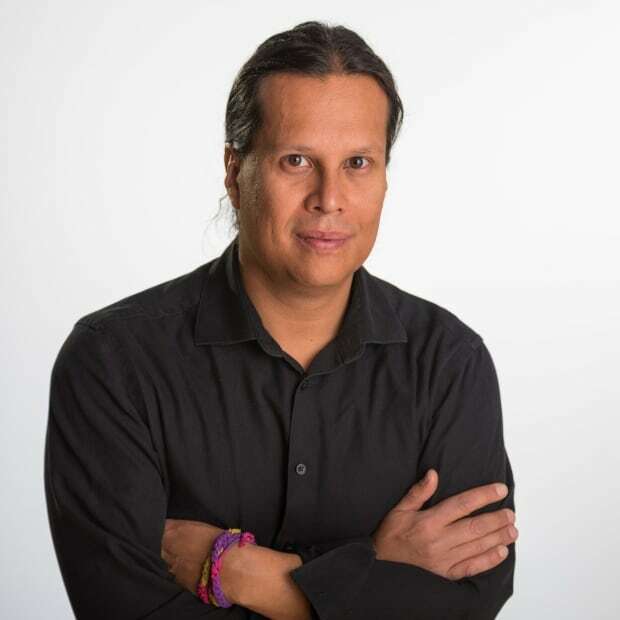 "I think that being a violent white man is just more acceptable than a non-violent Indigenous woman in that room and that is why I was removed and he wasn't." Still, she has no regrets. "I had successfully disrupted Trudeau, and I am happy I went in and did what I did," she said. "But I didn't deserve to be thrown on the ground by some stranger."